It’s my turn to host the Splitcoast Featured Stamper Challenge (FS608) & I chose Chrissy, aka DanceswithHooves. She has a lovely gallery & I chose THIS card to case. I kept most of the layout but ended up changing most everything else. Different stamps, dies & colors. 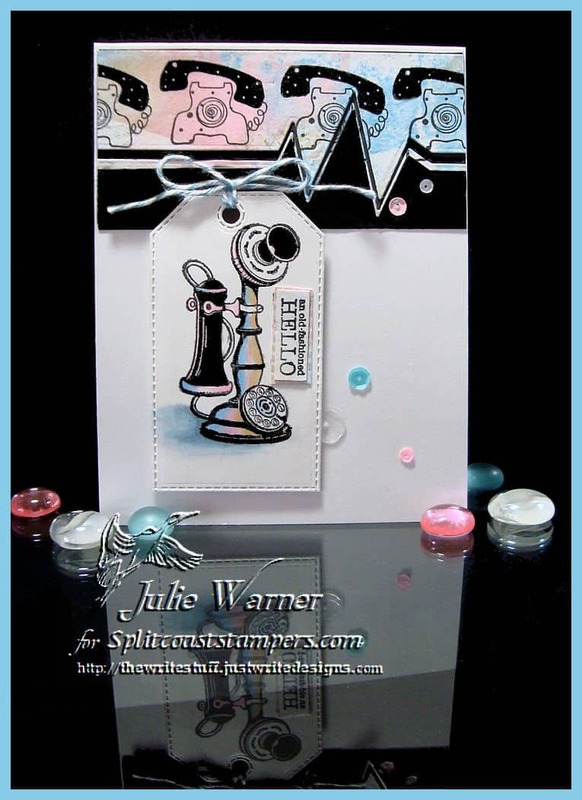 My card started with a leftover background & already colored image (you can see the other one on THIS post). As I’ve probably mentioned, I apparently save everything, lol. 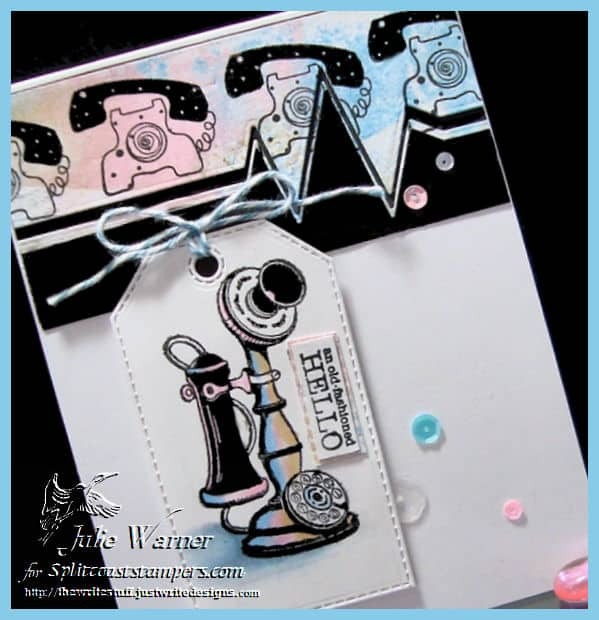 I stamped the other little telephone multiple times across the leftover background then used a zigzag border die to cut the bottom & add the black piece. Since most everything else was already made, this was a really quick card. Here’s a look at the inside & if you want the Copics I used, please click on the referenced green link above. Good thing I had that pic..no way I would have remembered what I used. And sadly, I think all of these images are discontinued but you can see the sets below. This is the first of 3 challenges I made samples for today in Splitcoast’s Dare to Get Dirty week! I made this one for Ardyth’s challenge. The scene was done w/ some masking and I used markers to color in the balloons and add a little color to the sky. I die cut the frame then brayered over it w/ a rainbow ink pad. Since the die embossed it, the ink really didn’t go into the indented part. The trees, bird and birdhouse were cut out and added on top and the sentiment was sponged with the die still in place. The finished card is 5-50 x 4.25. 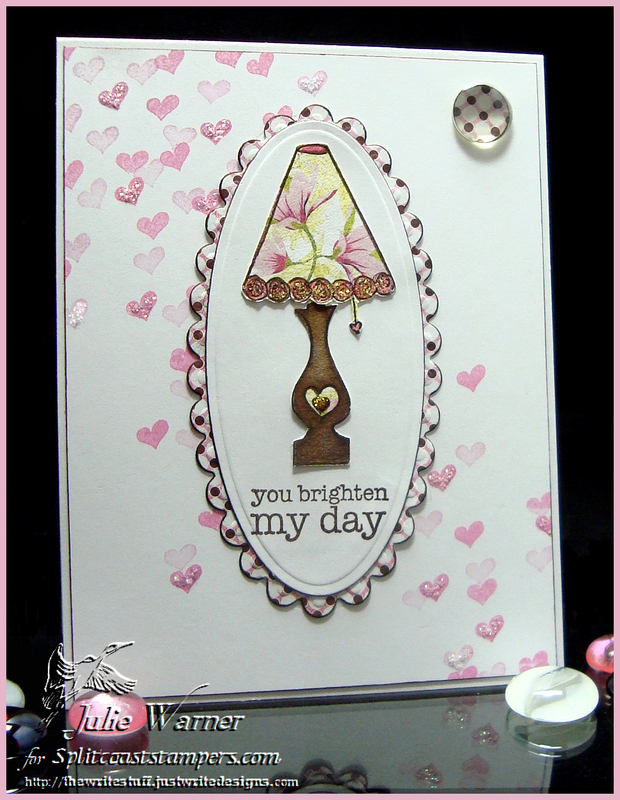 For today’s Featured Stamper (FS285), on this first card, I chose Sophie’s Bridal Shower Hearts. I just love the little falling hearts, so I kept them along with the CAS layout, but changed the images and shape of the main panels from squares to ovals. The images are from Avocado Arts. I picked them up at a convention a couple of weeks ago where I met up w/ friends, Sandee (stampersandee) & Penny (Pawallen). (Hi Sandee, hi Penny!!) The finished card is 4.25 x 5.50 and is pretty CAS. The lampshade was paper pieced from some long hoarded Basic Grey Sultry paper. You know years ago when I first joined Splitcoast, I noticed I had the moniker “Cardstock Collector” under my name. I was floored!! How did they know?? Really, I looked over my shoulder! Not much has changed, lol. I still collect! For my second card, I chose Sophie’s Hello Pink Flowers to case. I kept the flower theme and general layout, but changed the images, colors and turned it on its side. 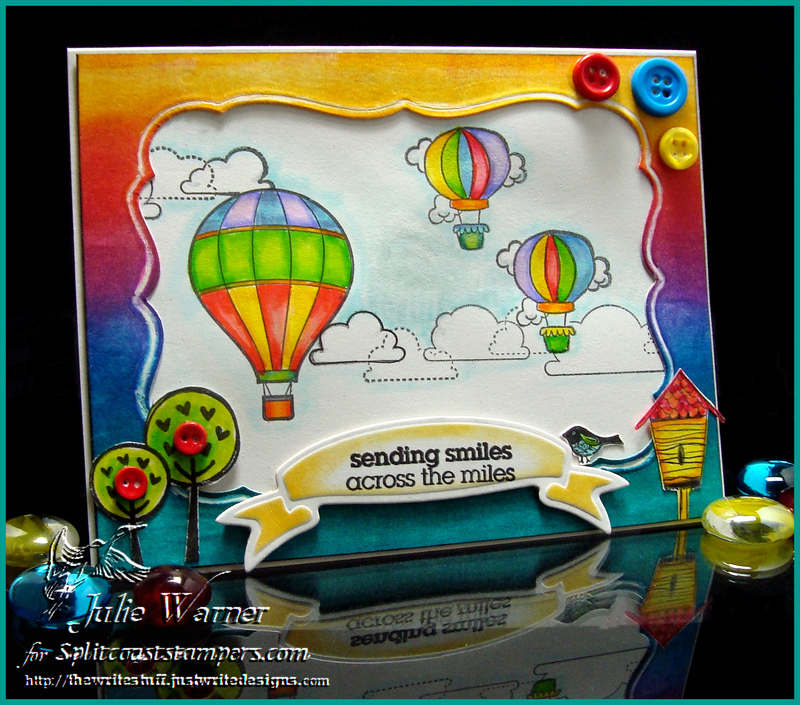 The images are from DRS Designs and the background was done with a masking/reverse masking using a Cheery Lynn sunflower die and a Spellbinders circle die and sponging on the colors. I had a little white frame left over from something and arranged my flowers in and out of the frame. 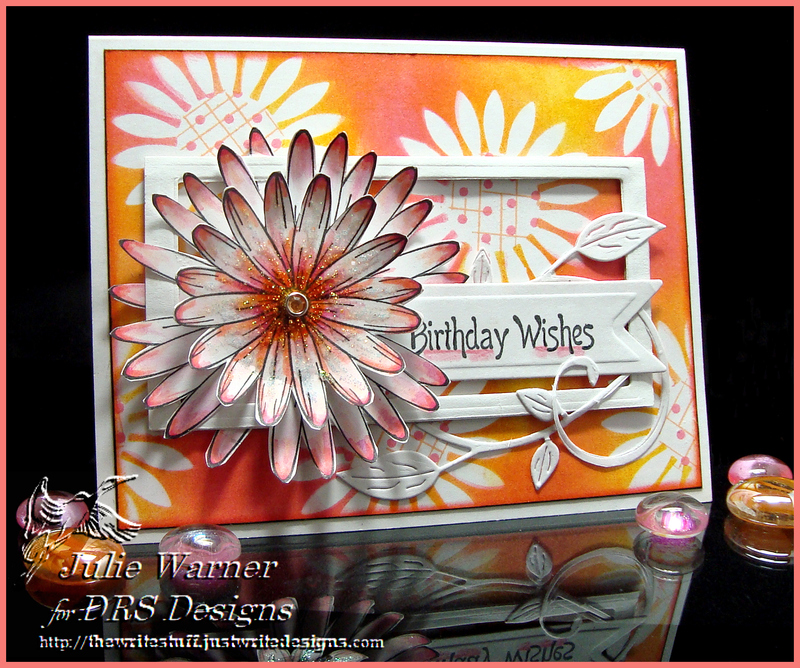 A little stickles was added to the flower center and the finished card is 5.50 x 4.25.